Shanxi's western and southern boundary is the mighty Huang He (Yellow River) while the Taihing mountain range ➚ marks its eastern limits; Shanxi is named from its location ‘west of the mountains’ compared to Shandong ‘east of the mountains’. Together with Shaanxi and Henan, Shanxi province is positioned in the fertile Yellow River valley which was the nucleus for the development of Chinese civilization. Most of the land is covered in loess - loose calcareous sand which is ideal for crop cultivation when irrigated. The northern boundary of Shanxi follows the Great Wall built during the Warring States period and then strengthened by Qin Shihuang the first Qin emperor, to mark the border and keep the barbarians out. Shanxi flourished up to the Tang dynasty, after which time the growing importance of the Yangzi basin; incursions by northern tribes; growth of sea trade and decline in use of the Silk Route all took their toll. 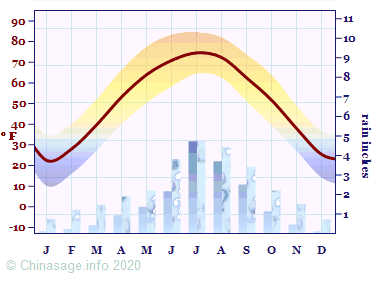 Centuries of slow decline followed. In the last hundred years extensive coal deposits have led to rapid industrialization and the province suffers from the attendant pollution - Linfen was classed as the world's most polluted city in 2007. In the Communist era attempts were made to improve agricultural yields; the commune at Dazhai village (north of Heshun) was held up as the example for all rural communes to follow. The leader Chen Yonggui ➚ became highly acclaimed but by 1980 the whole enterprise had been exposed as a fraud, set up as political propaganda. The industrialization of Tiayuan and Datong since 1949 has been far reaching and many of Shanxi's cities have an industrial feel. Ancient street (Ming and Qing dynsaties), Pingyao, Shanxi. Copyright Richard Wingfield, October 2017. There are many historic sights to see in Shanxi. Taiyuan has a fine provincial museum and the ancient Chong Shan temple. Bai yun (white cloud) monastery is close by.Datong was the dynastic capital a couple of times during China's long history. Hua yan Temple in Datong has a large hall with five gilded figures. Datong also has a Nine dragon screen to rivals those at Beijing. Congshan Monastery ➚ in Taiyuan dating back as far as the 6th century but rebuilt in the 14th. The Shuanglin Monastery is nearby. Guandi Temple ➚ at Xiezhou commemorates a famous General from the Three Kingdoms period who became the ‘God of Righteous Action’. South-west of Taiyuan is the popular tourist Ancient town of Pingyao ➚ with many intact Ming and Qing dynasty buildings – including the city walls and the Yamen. It is also mercifully free of cars. The town used to be an affluent banking center. Near Yuncheng are the Daoist temples of Yonglegong. The three main temples have fine murals from the Yuan dynasty. It is associated with the immortal Lu Dongbin. The Temple of the Three Pure Ones is one of the finest temples. Northern Mount Heng ➚ is a 6,617 feet [2,017 meters] sacred Daoist mountain in the north-east of the province (there is a Southern Hengshan too). Nearby is the famous Xuankongsi ➚ ‘Hanging Monastery’ clinging precariously to a cliff. Another place well worth a visit is the Wooden Pagoda ➚ at Yingxian. 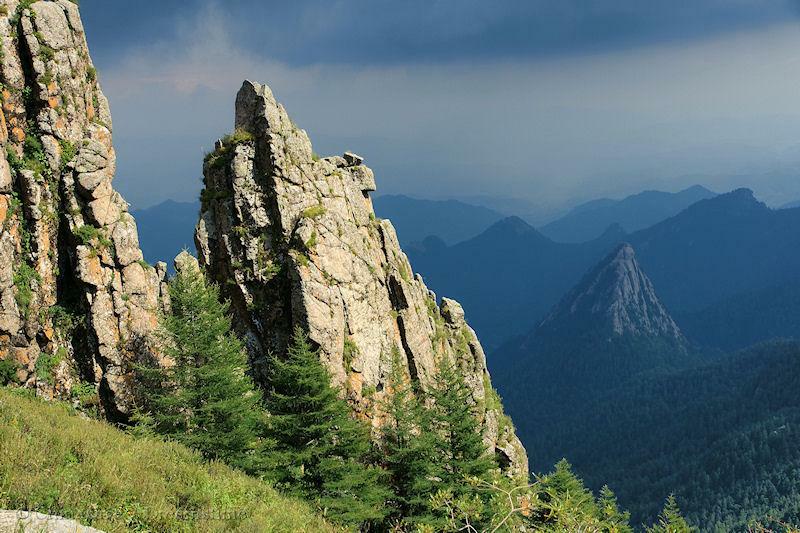 Wutai Shan (mountain) in northern Shanxi consists, as its name suggests, of ‘five platforms or peaks’. The highest peak is to the north and is 10,036 feet [3,059 meters] high making it the highest mountain ➚ in northern China. It had a road linking it directly to the Tang capital of China at Chang'an. Mount Wutai is one of the four sacred Buddhist mountains in China. The platforms are named after the five compass points, which in China include center. Where ground is protected from the sun all year round there is permanent snow cover. It has one of the oldest Buddhist shrines - Dafu Temple ➚ originally of Han dynasty date with 400 rooms. One room, the Bronze Hall, has impressive flowers and Buddhist sculptures all made in bronze. By its side stands a large white Dagoba (a Buddhist stupa). Set apart from the main group is the ‘Temple of Buddha's Halo’ with buildings dating back to Northern Wei and Tang date. The surrounding mountain area has extensive coal reserves. Jinci Buddhist Pagoda at Taiyuan, Shanxi. It is an octagonal Sui Dynasty structure standing 38m high with seven stories reconstructed in 1751CE. The ancient Buddhist Temple of Jinci ➚ is located 16 miles [25 kms] south-west of Taiyuan, Shanxi. Founded way back in the Shang dynasty at the springs that form the source of the Jin River, the temple complex has been much altered over the centuries. The foundation legend talks of a girl who was mistreated by her step mother; when the girl gave water to a passing mysterious horseman she was given a jar that magically refilled with water whenever the girl cracked a whip. The wicked step mother muscled in and tried her luck with the whip but this time the water flowed without stopping and turned into an ever-flowing Spring. The area is arid and so a continuous water source was a great boon. There is a Ming theater on Mirror Terrace where Huixian Bridge crosses the historic Zhibo canal. The ‘Offerings Hall’ was built in 1168 but the main attraction is ‘Mother Goddess Hall’ or ‘Sacred Lady Hall’ (Shengmudian) rebuilt in 1102 probably commemorating the mother of Shuyu ➚ of the Zhou dynasty. It is a very old wooden building with fine Song dynasty carvings. General Guanyu of the Eastern Han dynasty also has a hall there. Outside there is an ancient cypress tree reputed to be 3,000 years old. In northernmost Shanxi, 10 miles [16 kms] west of Datong, Shanxi are some of the best preserved Buddhist carvings in China. The Yungang Caves date back to the Period of Disunity (460-494CE). They were built by the short lived Northern Wei dynasty who had enthusiastically embraced the Buddhist faith. The carvings may have been modeled on the earlier ones at Dunhuang, Gansu but these are carved into the rock in the Indian tradition rather than molded. After the Northern Wei moved their capital from Datong to Luoyang in 494 the area fell into disrepair until the Liao dynasty ➚ in northern China repaired and restored the monuments. The valley has a series of about 1,000 grottoes with at one time an amazing 100,000 carvings of Buddha in all sorts of sizes and guises. There are 21 larger caves. However, over time the numbers have reduced to 51,000. The carvings are embellished with costumes and even musical instruments giving a vivid portrayal of life in ancient times. The 52 feet [16 meters] statue in Grotto 19 is an impressive carving and may represent the Northern Wei Emperor Daiwu ➚ (446-452) who persecuted the Buddhists. Shanxi province is divided between the cold and dry of the north and the hot and humid climate of the south. The soil is mainly loess but there are pockets of alluvium on the beds of dried up lakes that are more fertile. The province is notorious for extensive iron and coal mines as well as coal fired power stations . The local cuisine uses wheat and lamb extensively which gives it a distinctive northern Chinese flavor. 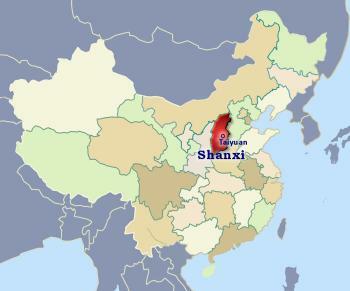 Citation information for this page : Chinasage, 'Shanxi, China', last updated 28 Nov 2018, Web, http://www.chinasage.info/maps/shanxi.htm.